Hello there, Monday! I am feeling vitally refreshed, and it probably has a lot to do with the amazing sleep I snuck in this past weekend. I slept deeeep, woke up early on Sunday, and treated myself to this antioxidant-packed (and tasty) face mask. Spending money on expensive creams with questionable ingredients is not my thing, so in my mind, why not spend money on something with multi-purpose? I love mixing up ingredients found in my kitchen to create the healthiest, cleanest skincare products. It's less expensive, and it's even better for your skin. How is it better? Well, you are going back to basics and getting it straight from the source. I'm sure there's an over-saturation of luxury green tea masks on the market, but it's also accompanied by chemicals to keep its shelf life. I love creating my own masks, because I can just make enough for a one-time use, and not continue to clutter my bathroom with products. Also, I use matcha in my daily green smoothies, and the raw honey is used in my morning oats, so this is a win-win. Let's talk Matcha Masks. I made this mask after a hot shower to make sure my pores were open and ready to take in this little piece of heaven. Leave it on for 10-15 minutes, and rinse it off with warm water as you massage your face in circular motions. 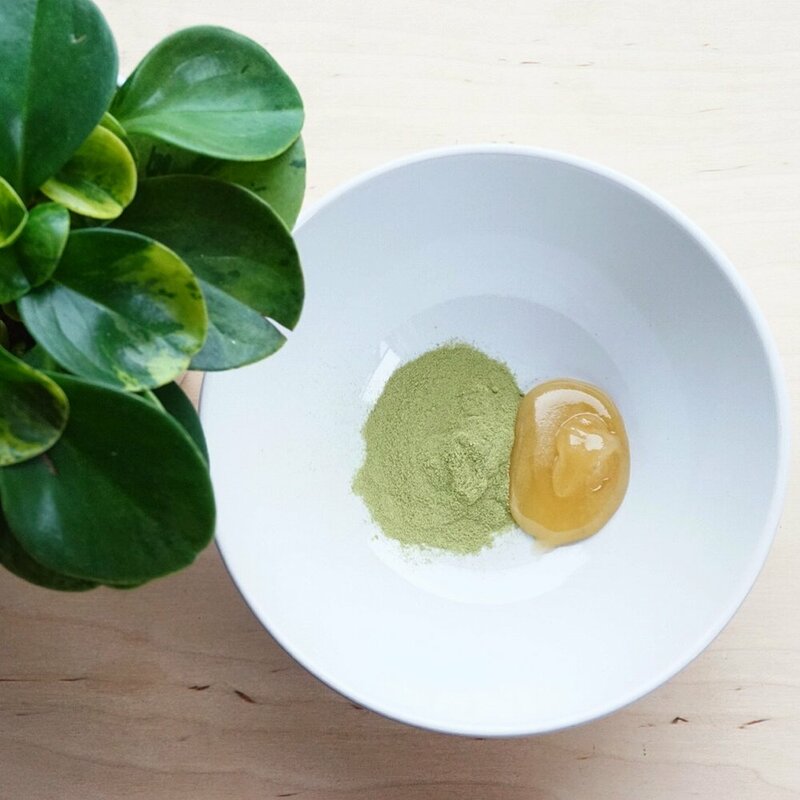 The matcha and sugars from the honey act as a natural exfoliant, so take advantage of this instead of just rinsing it all off in one go. 3. ANTI-AGING // WRINKLE PREVENTION: There are several different studies that conclude matcha can improve skin elasticity and prevent wrinkles. I personally notice my skin is much brighter and my pores are tighter (especially around my nose) since using this mask. This really ties back into the antioxidants. The wellness industry focuses highly on health from physical exercise and eating well, but I feel like skincare just gets a glance-over. What you put on your skin MATTERS... and not just for cosmetic reasons, but also for how it affects you internally through your bloodstream. 5. EVENS OUT THE SKINTONE: When I suffered from pretty gnarly acne, I had giant zits galore, but I also had a lot of redness in my skin. Since switching to my natural skincare routine a few years ago (read about it here), I've reversed much of the damage, but I'd say a portion of the healing process can be contributed to once a week facials masks (I also still like to use this Calcium Bentonite Clay I wrote about a couple years ago). Phew. Congratulations on making it to the end of this lengthy, informative post. I hope you thoroughly enjoyed the photo of me lookin' like a swamp thing. I do it all for you guys. I felt extra glowy after the mask, as you can see from my smiley, post-shower towel selfie. I just want to be real with you guys, so please don't hesitate to ask your questions (emails are better than Instagram messages, so I can give you more in-depth answers)! Have a wonderful, fruitful, and productive week ahead my loves. I hope you feel empowered and excited about the month ahead.